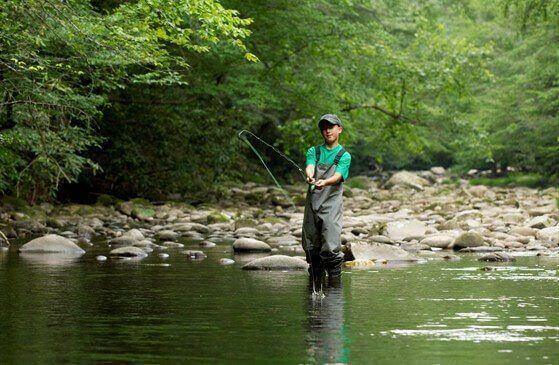 The Great Smoky Mountains is a fisherman’s paradise. In fact its rivers, streams and tributaries are some of the last remaining wild trout habitats in the Eastern United States. With over 2,000 miles of streams within the park boundaries, the Great Smoky Mountains offers a wide variety of angler (fisherman) experiences. From isolated headwater trout streams to larger, cool water smallmouth bass streams, there is something for anglers of all ages and skill sets. The Gatlinburg area offers a wealth of expert knowledge on fishing. You can choose to research on your own or get an insider’s expertise by hiring a local guide or visiting an area fly fishing shop. Both the Smoky Mountain Angler or Little River Outfitters Fly Fishing Shop & Fly Fishing School are great places to start. Located near downtown in Winery Square, Smoky Mountain Angler is the oldest and most esteemed fly fishing shop in Sevier County. Operating since 1998, this shop is a TWRA license agent, offers rental gear, guide service and local hand tied flies. 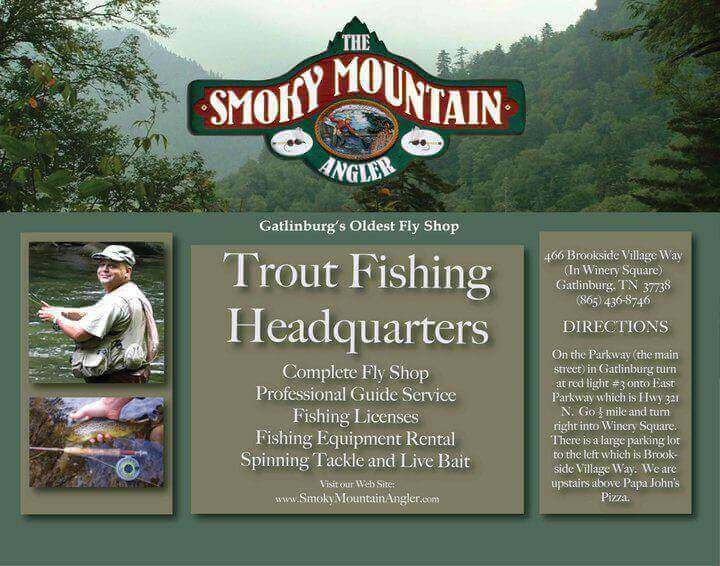 Smoky Mountain Angler is a favorite fly fishing hangout for many area fly fishermen in the know in Gatlinburg. This one-stop-shop has everything you need to equip yourself for your fly fishing expedition or hire a guide to take you out. You can also check out their online “Fishing Report” to find out what fish fly fishermen are catching and on what type of flies. 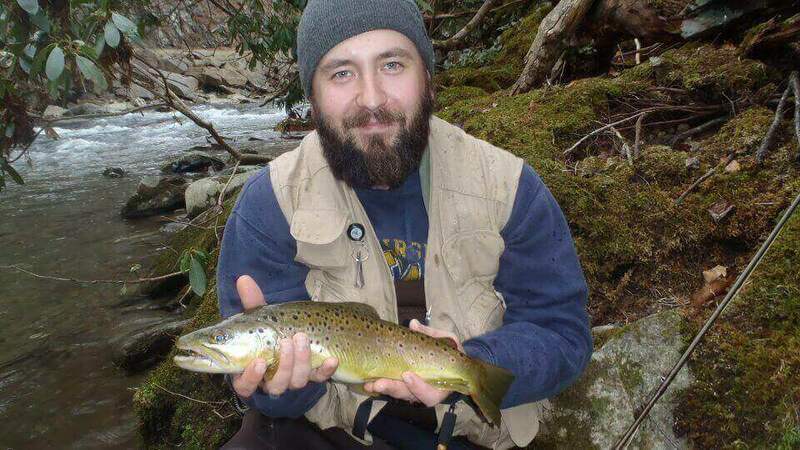 With years of experience fishing in the Gatlinburg area, Smoky Mountain Angler guides offer expert teaching for techniques for catching wild mountain trout. They are skilled at working with fly fishermen of all levels from very beginner to seasoned veteran. They also stay abreast of the latest and greatest fishing holes, as well as what types of flies trout are biting on. Guides can take out 1-3 clients at a time, and Smoky Mountain Angler offers half and full day trips. Little River Outfitters, opened in 1994, is also a favorite informational spot for locals and visiting fishermen to East Tennessee. They specialize in helping novice through to advanced anglers (fisherman) take advantage of the great wealth of wild water fishing areas in the Great Smoky Mountains National Park and all over Eastern Tennessee. Located in Townsend near the Cades Cove entrance to the Great Smoky Mountains National park this outfitter, fly shop, and fly fishing school has built themselves a lasting reputation for their experienced staff, fishing gear, and more. One-of-a-kind for the area, Little River Outfitters boasts an impressive fly fishing school with a classroom built-in onsite. This Is a great place to begin with fly fishing courses for beginners; as well as classes divided into beginner, intermediate, and advanced levels. They also offer a fly-tying class. Recently, they have offered a course Aquatic Entomology for Anglers taught by Dr. Brad Cook, professor of biology and Tennessee Technological Institute. Their website features an online store, daily fishing report, and an ever popular message board where anglers ask questions, offer tips, and report on their fishing adventures via categories. 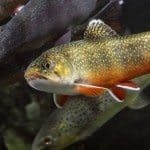 The only trout, native to the Southern Appalachian, are Native Brook Trout. Brook trout live in higher elevations and are harder to find. 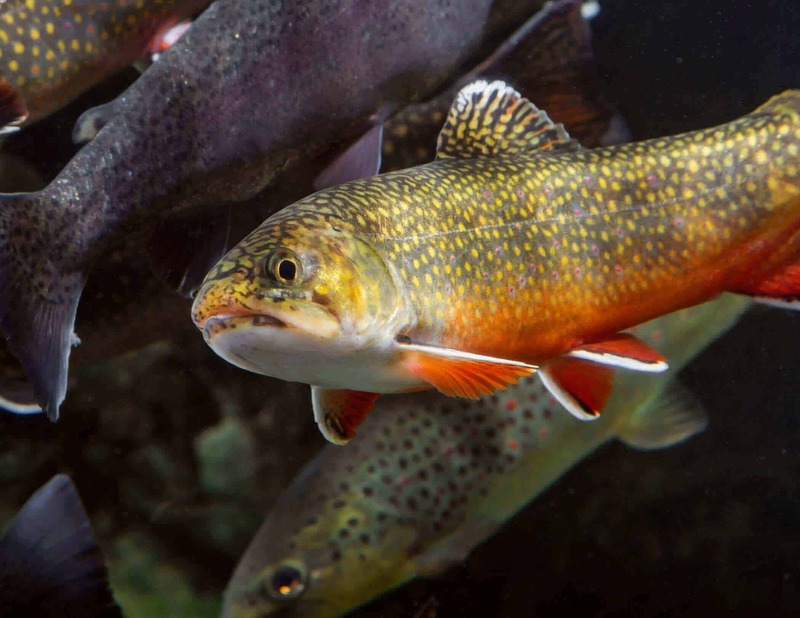 These trout are brightly colored and smaller than other trout, but catching a Native Brook Trout is considered quite an accomplishment by local fly fisherman standards. The rarest (hardest to find), you have to know where they are in order to catch them. Though introduced to the Great Smoky Mountains National Park by outside source, this trout is the most common trout found in Smoky Mountain streams. 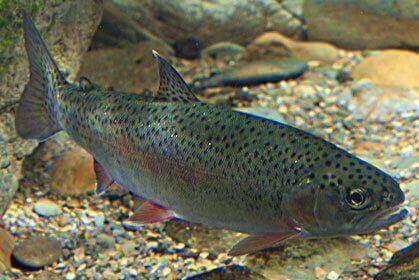 These rainbow beauties prefer the faster flowing, cool waters, common on many of the larger mountain streams. The biggest trout in the park, Brown Trout tend to feed at dark and they can tolerate warmer water temperatures than other trout. Because of their larger size though, these trout they can be harder to catch and land. These trout like to hide in shady spots, under structures and near river banks. These flies are must have for any serious anglers. Highly recognized for their versatility and ability to land fish in many different environments, but especially in the Great Smoky Mountains. 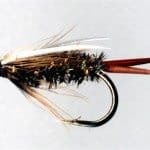 According to Brad Dodson, Fisheries technician and fly fishing expert, prospective anglers and serious fisherman should definitely consider using these when fly fishing in the Great Smoky Mountains. 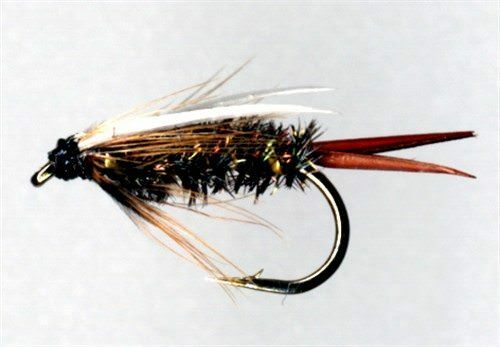 This dry fly pattern was first tied by Lee Wullf and used for many years with great success. This buggy, dry fly imitates many mayflies and terrestrials. This fly can be fished in slow or fast water, and is known is also known to be successful in rough water. This fly is a must for fly fisherman. One of the most versatile of all dry flies, the Parachute Adams is a famous dry fly for catching fish of all sizes all over the world. 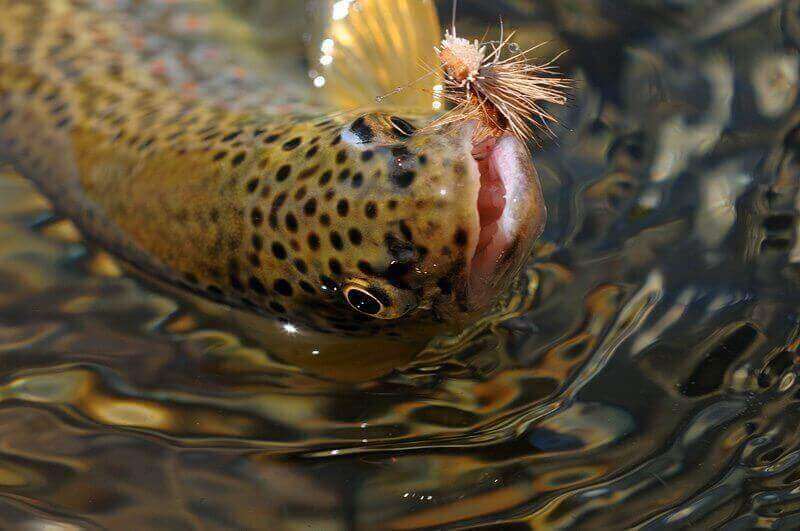 It’s popularity comes from its ability to imitate many members of the mayfly and caddis families. 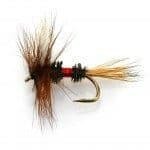 This fly is also versatile in a variety of streams with swift or slow moving water. Learn more. The Yellow Stimulator is another angler must. It’s true inventor is up for debate. Though many people credit, famous West coast angler Randall Kaufman, others claim that Jim Slattery tied the first pattern. What is not debated is the Stimulators versatility, buoyancy, and ability to be fished in very fast and slower streams. 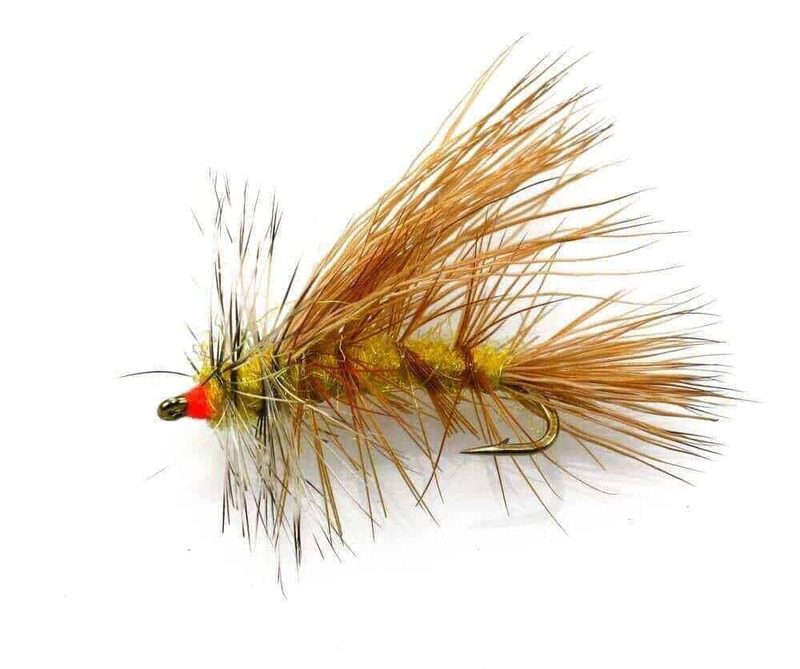 Like the Parachute Adams, this fly is extremely versatile as it represents many things appealing to the fish. Learn more. Developed by Doug Prince in the 1930s, the Prince Nymph is ranked by many to be one of the top flies of all time. 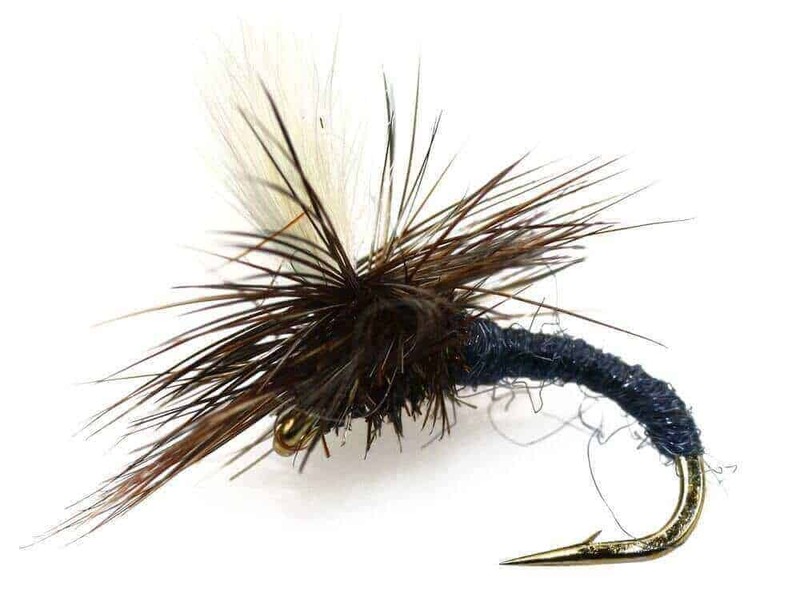 The design can give the impression of a stonefly, backswimmer, or dark mayfly nymph, whatever the impression this fly is a favorite with the fish. 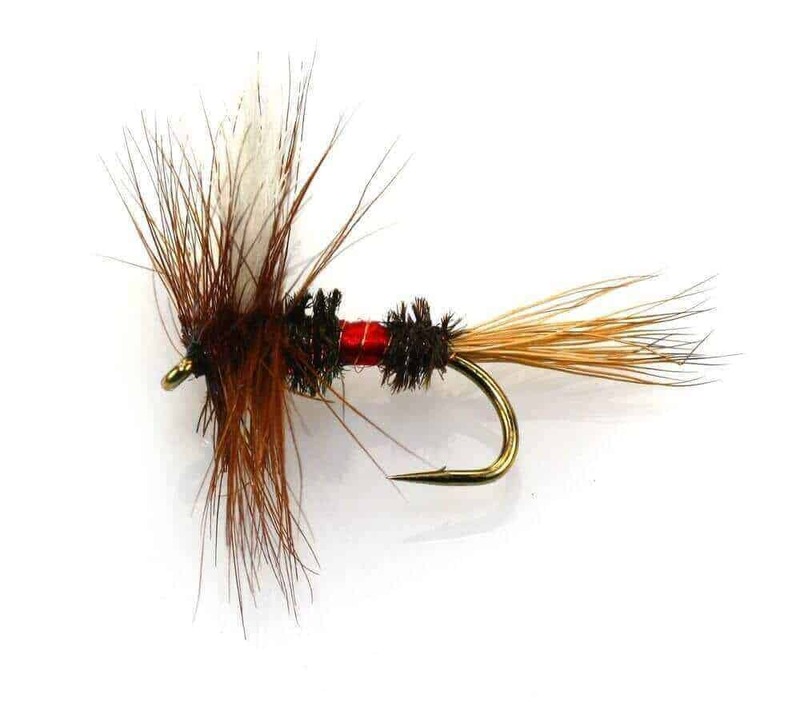 Mostly used in fast water, this fly can be used in warm water as well. Created by John Barr of Boulder, Colorado, this newer and very popular fly has been a hit in the fly fishing kingdom. This fly sinks quickly and can be used as a deep water dropper. Fish can’t seem to resist this flashy fly. It is best used in areas where stoneflies and mayflies are common, and can even be used in some lakes. Learn more. Easily the most popular stream in the park this is a frequented fishing destination so be prepared to encounter other fisherman along the way. The East Prong of the little river flows along much of the road from Elkmont Campground; therefore offering easy parking and access. This stream offers a variety of trout, rainbow, brown, and native brook in varying sizes. Brown trout can get especially sizable in this stream, though they are harder to catch. This river also offers the opportunity to catch all three trout: brown, rainbow, and native brook along different parts of this stream. Also, Brown Trout in this river can get rather large. Learn more here. 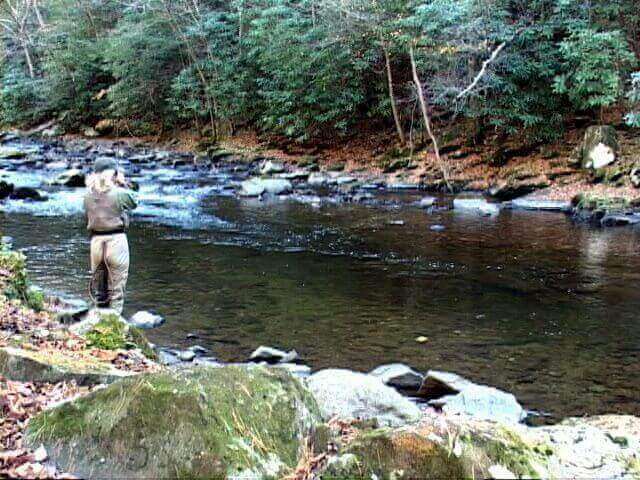 Also one of the most popular fly fishing streams in the park, West Prong of the Little Pigeon River is well-known for several reasons. First of all, this stream is extremely accessible. Starting from the main entrance of the Great Smoky Mountains National Park near Gatlinburg, this stream follows highway # 441 and can be accessed along the road for several miles. It’s also easily accessed from the Chimneys Picnic Area. The lower, and more easily accessible areas, offer average size rainbow trout. Though, upper and more advanced parts of the stream also contain brook trout. This stream is good to fish year round. 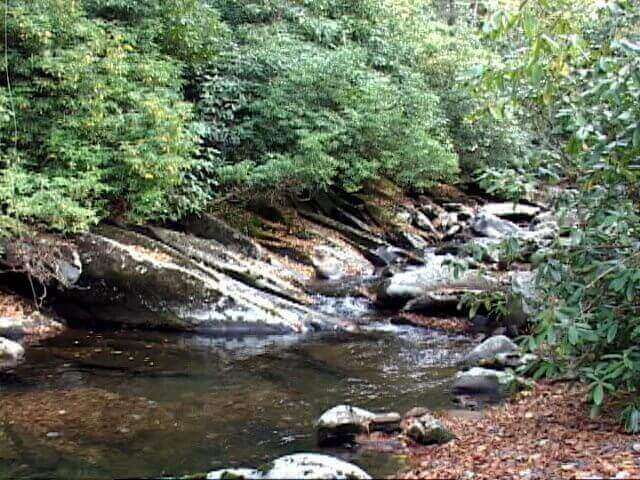 For visiting Fly Fisherman that are already spending time in the Cades Cove area this stream is perfect fit. This stream winds through Cades Cove and eventually disappears underground to resurface in another part of the park as Abrams Creek. 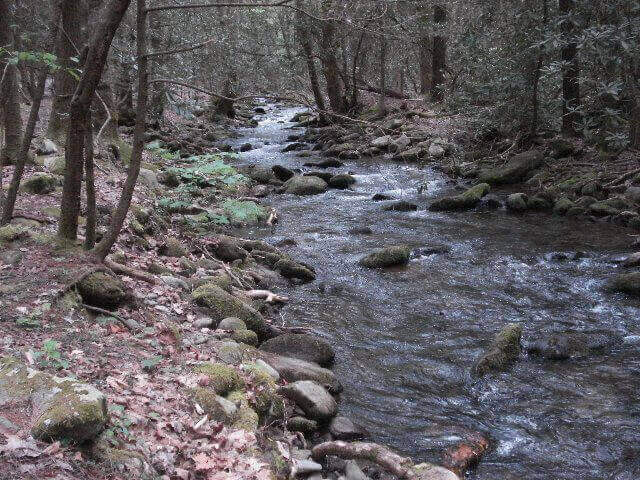 Anthony Creek is easy to access at its lower portion, as it runs right through Cades Cove picnic area. However the upper parts of the stream are more difficult to access as they are more narrow and packed under a dense canopy of foliage. There are some fly fishing trails that follow the stream up, but the easiest way to up is to wade up stream. Wild rainbow trout populate this stream, and the lower portions are good places to take kids learning to fly fish and practice casting as it is wide in parts. By far considered one of the best streams to fish in the park, Abrams Creek is quite different from other streams. Boasting special water chemistry with a higher pH than other more acidic streams in the park, this stream consequently contains more food for trout. Therefore, it contains a plethora of trout because of the great food sources it offers the fish. Rainbow trout in this creek are more sizable than anywhere else in the park;Abrams Creek is considered the best rainbow trout spot in the park. One thing to note is that access to Abrams Creek can be tricky and difficult, so you should consider a guide or going with someone who is well versed in the trails that lead to different parts of this creek. Rainbow trout and smallmouth bass are the most common fish found in this popular creek. Big Creek flows from high elevations headwaters within the Great Smoky Mountains National Park. Though the stream size is medium to large, this is one of the least populated fishing areas in the park. So if you are looking to getaway from more popular fishing spots, this may be your best bet. However, this stream does contain swift moving water with large boulders and some deep pools, which can make access challenging. 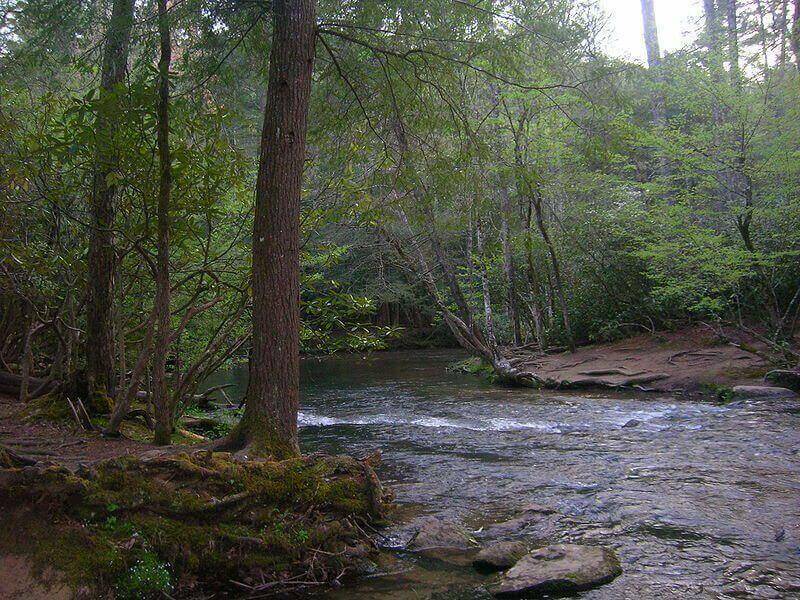 The lower portion is the easiest to access at the bottom through the Big Creek Campground and there are some angler made trails that permit access in other areas. Rainbow trout are commonly caught in the lower parts of this stream. While, the upper portions of this creek, which are challenging to access, are known as good places for landing Native Brook Trout. These natives are also found on some of the small tributaries that branch off of Big Creek. Kids love to fish too. The thrill of that tug on the line, their hearts racing with the anticipation of catching a sneaky fish. However, fly fishing can be a challenge for little tikes or older family members that may have trouble with stream access, equipment needs, and complicated casting techniques. 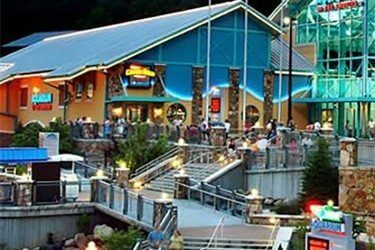 The Gatlinburg area offers many options that are calmer more relaxed fishing endeavors that take some of the pressure off the parents. For the little ones or older ones in your clan consider taking them to one of these other local options, and enjoy watching the kiddos squealing with excitement or your older loved ones chuckling with pleasure at their catch. Owned by Larry and Sue Smith, Tuckaleechee Trout Farm & Restaurant is a favorite place to fish and catch your dinner. 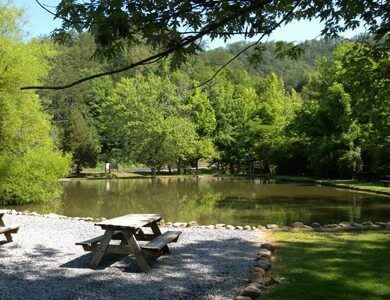 Located in Townsend Tennessee, just outside of the Cades Cove entrance of the Great Smoky National Park, this trout farm features several spring fed ponds. Its ponds pump a 1,000 of gallons per minute, and they are routinely stocked with trout. You can help your young ones pull one in, and if they want they can contribute to your evening meal. Tuckaleechee Restaurant will clean and dress your fresh caught trout and serve it with their seasonal vegetables and fresh hushpuppies. They are so quite famous for their scrumptious Blackberry Cobbler. English Mountain Trout Farm & Grill is located in Sevierville, Tennessee. This local joint has a trout pond fed by a freshwater stream and is chocked full of delicious rainbow trout. Your family can catch trout, have them dressed and clean, and then move on to the grill. The English Mountain Trout Farm Grill features a variety of options for devouring your catch. For example your fresh fish can be fried or blackened. Not only does this area dude ranch feature horseback riding, A.T.V. trips, and a petting zoo; but they offer family fishing right on the ranch. For family members that are excited to catch fish, but not so keen on eating it, this spot is perfect. The large pond at Big Rock Dude Ranch is stocked with Blue Gill, Croppy, Catfish, and Bass. This pond is catch and release, so your loved ones can have the thrill of pulling it in, and then feel happy about returning the slippery fellow to his home. Big Rock Dude Ranch supplies everything you need for your family fishing experience including rod, reel, and bait. Also, no fishing license is required and your fishing pass is good for a week so your family can return to fish to their heart’s delight. 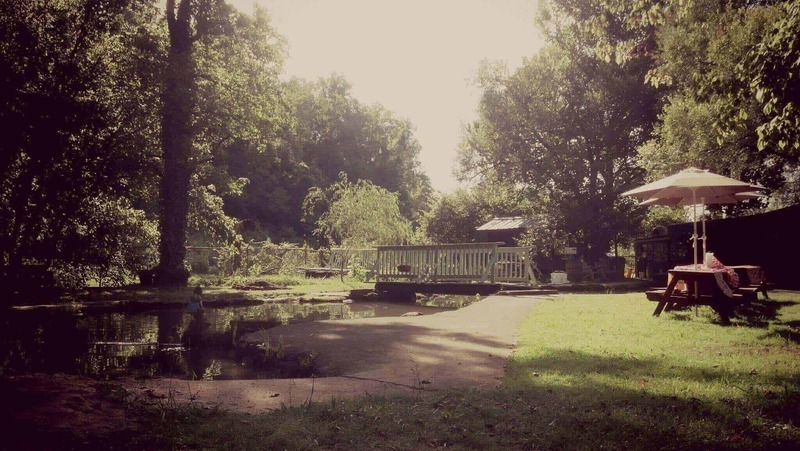 For those seeking a more authentic fishing experience that is kid friendly, Herbert Holt Park is the place for you. This Gatlinburg City Park offers fishing for children and the disabled only. This park is also the site of The City of Gatlinburg Trout raising facility. Your family can see where the city raises the rainbow trout to be stocked in area streams. In addition to the park’s covered pavilions, picnic tables, horseshoe pit, grill, walking trails, and a playground area, this park features designated fishing areas for children; as well as a small fishing pier with handicap access. For this fishing experience your family will need to bring their own fishing equipment and bait; as well as purchase a fishing permit. Learn more here. 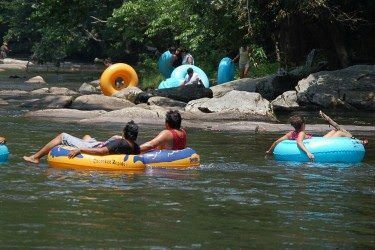 ** Other designated children’s fishing areas include North Gatlinburg Park and Mynatt Park. Both of these sites are marked with signs which indicate the boundaries and are heavily stocked with trout. During the open fishing season (April 1- November 30th) anglers can fish anywhere in the Gatlinburg City limits or the Great Smoky Mountains National Park as long as they possess a valid fishing license. The one exception is Thursdays, when you cannot fish within the Gatlinburg City limits. 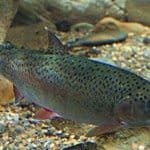 The City of Gatlinburg has its own trout farm and stocks rivers and streams on Thursdays; therefore fishing inside the city limits on these days is off limits. These are good days to fish inside the park. On top of the state of Tennessee Fishing License requirements, a local permit is required for residents between 13 and 64 years of age, and for non-residents 13 years of age and above. Please note there is no exception for over 65 non-residents. Fishing is permitted year round in the Great Smoky Mountains National Park, though spring and fall are the best times to land trout. Fishing is allowed from 30 minutes before sunrise, to 30 minutes after sunset. Anglers (fishermen) can catch a maximum of five (5) trout per person for General Streams and two (2) trout per child on Children’s streams. Total limit of trout per fisherman is 5. All fish caught must be released immediately unharmed to the water. Possession of any trout is strictly forbidden. Only single-hook artificial lures can be used during this season. The use of or possession of any live bait is prohibited. 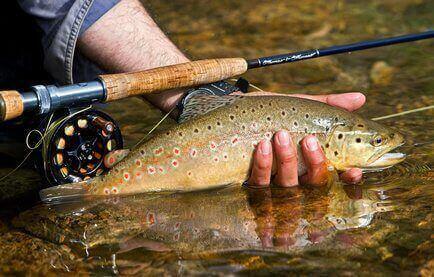 Like any sport having the right gear is an important part of fly fishing. “Polarized sunglasses will aid in seeing the flies and cutting glare off the water’s surface. Tapered leaders and tippet are good to have with. A comfortable, supportive pair of wading boots. Felt soles give the best traction on Smokies streams. Extra care needs to be taken with any wading boot and waders to clean them when going to different watershed areas as to not transfer invasive species. 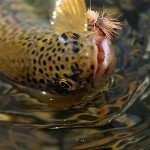 Dry fly floatant either gel floatants like Loon Aquel or a powder floatant like Frog’s Fanny or Loon Top Ride will help keep dry flies floating longer. Local fisherman coined the term the “Smokies Slam”. In fly fisherman lingo this means catching all three trout: Native Brook Trout, Rainbow Trout, and Brown Trout all in the same day and in the same stream. This is no easy task and there are only select streams in the park where this can be accomplished! Be in know about local fishing regulations before you cast!